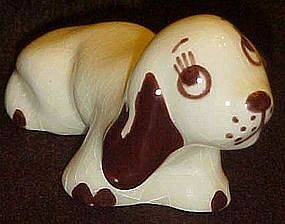 Adorable little pottery dog figurine with big sad eyes. Made by Walker, Rio Hondo, or some other California Pottery. Measures 4" long and 2 1/2" tall. Very nice condition with no damages.